Repetitive practice, both imagined or physical, drives brain activity that ultimately underlies recovery post-stroke. However, this brain activity can vary across individuals and tasks when practiced using motor imagery. Because driving brain activation in the ‘right’ areas is what allows us to ultimately re-learn skills, it is important to understand what might influence brain activity driven by motor imagery. This project seeks to examine how someone’s physical expertise of a skill may impact brain activity driven via motor imagery, by comparing brain activity during motor imagery of highly familiar (performed regularly) vs. non-familiar tasks. The information gathered in this study will help us understand whether we can use someone’s skill expertise to optimize brain activity during motor imagery for recovery post-stroke. 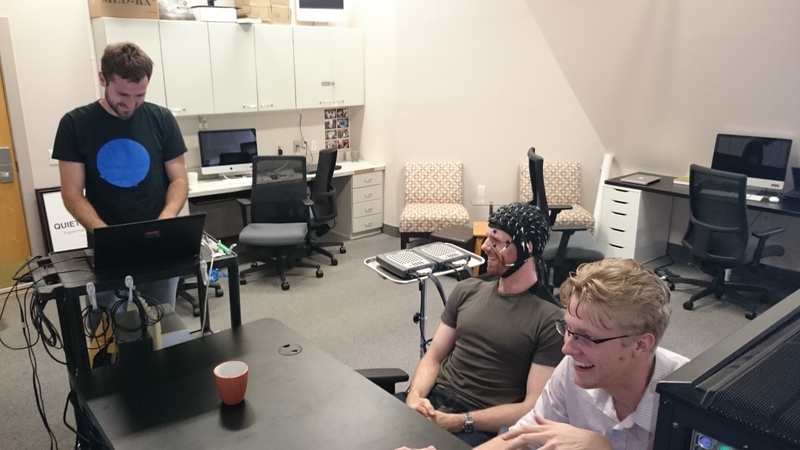 MSc student Chris Friesen working on his BCI project for imagined imitation with lab members Tony Ingram and Karl Simon. Chris’s project uses EEG to provide real-time neurofeedback to help with imagery performance. iImagine: Digital physiotherapy for survivors of stroke? Following a stroke, the brain requires repetitive practice to change and recover. However, patients are often easily fatigued, and in some instances are not able to move the arm or hand affected by the stroke. Studies have now shown that both imagining and watching arm movements, in addition to regular therapy, can improve recovery. However these techniques are not often used. Enter neurofeedback—feeding information on brain function back to the patient in real time, while they imagine movements. We’re designing a novel neurofeedback system that strives to both increase effectiveness and be user-friendly, with a long-term vision of having this cost-effective therapy gain mass adoption. Learning and rehabilitation are dependent on our brain’s ability to change. We can make our brain more susceptible to changes by increasing its excitability, or ‘priming’ the brain. Aerobic exercise is an exciting method of priming the brain: not only does it work the heart and lungs, but it has been shown to increase excitability in brain areas that weren’t involved in controlling the exercise — pedaling a bike can prime the brain areas that control the hands! Priming the brain before therapy may improve clinical outcomes, so understanding how aerobic exercise does this is important. In this study we are investigating whether or not aerobic fitness plays a role in the priming effect. Motor imagery (MI), the mental rehearsal of movement, can help us learn and improve skills as an adjunct to physical practice. But what if you are unable to engage in physical practice, such as after stroke? To use MI in these domains, we need to establish whether MI on its own can produce learning. Further, brain damage that results from stroke may impact on the effectiveness of MI. This project characterizes MI-based skill acquisition with and without brain damage, using transcranial magnetic stimulation to temporarily ‘turn down’ brain activity. Ultimately, this work will inform on the use MI for skill acquisition in health and disease. Aerobic exercise has been shown to increase activity in parts of the brain that are responsible for movement. Activation of these brain areas can help with recovery of function in people who have lost the ability to move as a result of brain injury. But what are the best exercise parameters (like intensity and duration) that can turn on these brain areas without tiring the patient? This project aims to test how activity in the brain changes as a result of varying intensities of aerobic exercise. The main goal is to identify the lowest intensity of exercise needed to increase activity in the brain, and to evaluate the mechanisms underlying these changes in activity. The outcome of this work will aid in the development of protocols that use aerobic exercise to prime the brain before rehabilitation. We remember how to ride a bike because the brain stores this information through complex networks of connected brain regions. Repetitive practice rewires the brain to make these networks more efficient. Our lab works to identify the most important connections for learning a skill, and is currently testing new methods of safe brain stimulation to enhance these connections more specifically. The goal is to develop the most effective procedures for enhancing learning, and to apply these techniques to rehabilitation. Can you shoot free throws better than Shaquille O’Neal? When a person learns a motor skill like shooting a free throw, the brain creates a motor plan, which is then updated each time they physically practice the skill. But what if you can’t physically practice? Can you still create and update a motor plan? This project seeks to answer this question by investigating whether a motor plan can be created using motor imagery (MI), the imagination of movement, without any physical practice. We’re going to teach novice basketball players a free throw with MI, recording changes in brain activity and performance. The goal is to learn more about how we can use MI to teach new skills. We know concussions impair learning and memory in the short-term. Recently, a conclusive link has been identified between repetitive concussions and the development of learning and memory-related pathologies later in life. Nevertheless, not all studies evaluating learning and memory in previously concussed individuals demonstrate definitive cognitive impairment in the long-term (i.e., years after the injury). Insufficiently sensitive methods used to assess learning and memory may account for this finding. To better understand the long-term implications of concussion, we are conducting a systematic review that synthesizes the current literature relating concussion history to long-term learning and memory impairments. Repetitive practice drives changes in the brain, which leads to learning new skills. While physical practice is the ‘gold standard’ of learning, we can also imagine ourselves performing the task without moving (called motor imagery) to learn new skills. However, we don’t know how fast we can learn a skill using motor imagery or how much training is required. Do we learn at the same rate as when we try to learn a skill using physical practice? And is the amount of training that we need equal? This project aims to investigate the rate of skill acquisition via motor imagery-based practice. The information gathered in this study will contribute to our understanding regarding the application of motor imagery as a form of practice in sport and rehabilitation. We learn and improve our skills by practicing them. When we learn skills, part of the learning happens without our conscious awareness – this is called implicit learning. Most research studies that look at implicit learning have people practice simple movements. However, something we’re not sure about is how implicit learning occurs in more complex movements. The purpose of this study is to examine implicit learning a complex skill.